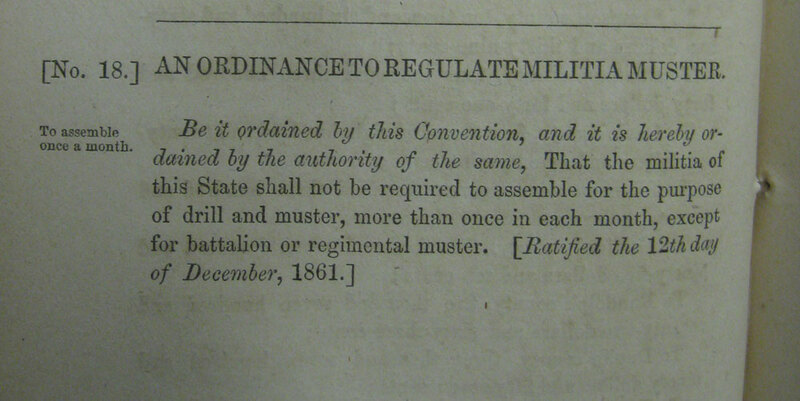 Item description: North Carolina’s Secession Convention passed this ordinance to regulate how often local militias could be drilled or mustered. AN ORDINANCE TO REGULATE MILITIA MUSTER. To assemble once a month. Item citation: Ordinances and resolutions passed by the State Convention of North Carolina. Raleigh, N.C. : John W. Syme, Printer to the Convention, 1862. VC342.2 1862o, from the North Carolina Collection, Wilson Library, UNC Chapel Hill. This entry was posted in North Carolina Collection and tagged local militia, militias, muster, North Carolina, ordinances, Secession Convention. Bookmark the permalink.